We have a VERY VERY VERY special friend. Her name is Toni. She’s also known as Tone. She was in a very very very dark place… she decided that her life was worth something and she didn’t want to die. For that miracle, we are very grateful. She survived cold turkey from drugs and alcohol and was reborn!!! To her, her AA Birthday is more important than her Belly-Button Birthday. So, everyone, please join me in congratulating Toni in being sober for 24 years!!! 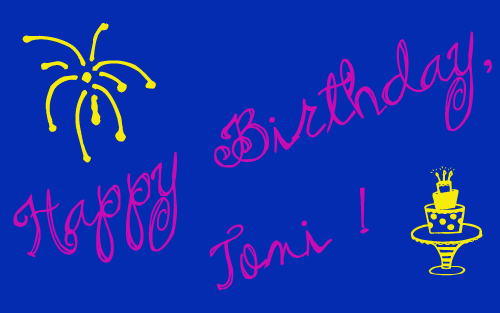 Toni, we thank God for bringing you into our lives. Not for just helping Hubby get out of the building to help me bring our daughter into the world, but being one of the best friends we’ve ever known. Congrats Toni! Thanks for helping my dad get out of the building or he might have never made it to my birth haha. I know my mom and dad are very thankful to have you in their lives and anyway I wish you many more years of happiness and sobriety! Toni, I’m sure, positive, and certain that you have had great influence on many other people during these past 24 years. Praise to your maker for stepping into the light. Oh you don’t know the half of it. After leaving Intel, she is working for an organization helping low-income and homeless. She said yesterday that she has “340” (or something like that) clients. I’m sure they are all just as appreciative as we are. She also was willing to be there any time day or night for another friend of ours, whom she didn’t even know, who was in recovery. i love this! what a great post to read at the start of a brand new year.